Dear readers, let me first wish you all a happy and successful working year 2017! And having said that, I can share with you a great piece of news. Already before the ITB office building was opened to start the new working year, our professor Michael Gessler had a great message to us: The brand new IJRVET Yearbook is available as an online version and as a print version. Now, for the European and international research communities in the field of vocational education and training (VET) this is such great achievement that it merits to be discussed in a specific blog post. So, I will start my working year with this topic already before I have come to my office. So, in a relatively short time the IJRVET and the supporting European and international VET research communities have taken major steps forward. We are looking forward to further steps during the year 2018 and from that year on. Posted in education, Innovation, networking culture, open access, participation, workinglearning | Comments Off on Great start for the new working year – The IJRVET Yearbook 2017 is available! This year I managed to start my holiday break early enough and with a firm decision to leave the work-related issues to the year 2018. Yet, little by little, the feeling creeps into your mind that you should say something about the highlights of the year 2017 that is soon coming to an end. And this time, it is clear, I need to report on a special cultural experience – our visit at the Kuhmo Chamber Music Festival 2017 – and how I turned into a passionate fan of classical music and of certain artists. And suddenly I find myself having a new priority area when writing updates on Facebook. But let’s start with Kuhmo and the festival and what it is all about. Kuhmo … ? 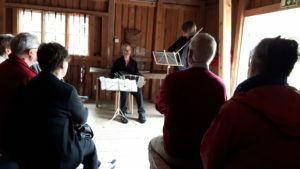 And Chamber Music Festival in Kuhmo …? Once upon a time – over 40 years ago – a Finnish top musician Seppo Kimanen, who had already become an international celebrity, had a crazy dream. He thought of setting up a chamber music festival in such a remote place that the artists will come for a week or two without having a temptation to rush away after one or two performances. He looked at the map of Finland and found an ideal place – the municipality of Kuhmo in the Central North-East part of the country. Indeed, Kuhmo was remote from the ‘metropols’ of Southern Finland and of the relatively big cities of Northern Finland. It was remote from everything else except the Russian border, the wild woods and the nice lakeside landscapes near the centre of the municipality. Kimanen managed to get the festival up and running and – after the difficult and ascetic beginning years it became a success story. Several years ago Kimanen handed over the responsibility to his successor, Vladimir Mendelssohn, an international musician, who is active in Finland. And in the course of the years faithful fans and committed artists have returned year by year and seen a marvellous concert hall being built to accommodate the main concerts, whilst part of the concerts are still going on in a school building, in the church and elsewhere in the region. Also, the Kuhmo experience has become a special concept, as the expression ‘the Kuhmo Planet’ indicates. For us – my partner Johanna and myself – Kuhmo has become a ‘must’ already long ago. Johanna, who comes originally from that region, has been a faithful fan of the first moments on. I have joined her later as an ‘avec’, who has gradually learned to enjoy the music. However, our participation had so far been based on commuting from the neighbouring Sotkamo and attending some selected concerts during one week. This has given some insights and impressions, but not much more. But this year we decided to take a ‘bigger package’. We took weekly tickets for both festival weeks and accommodation in the centre of Kuhmo. This enabled participation in a wider range of concerts and into other activities. And it provided us the possibility to follow the concerts with a focused approach. For us, already one of the first concerts alerted us to something special that was coming up. The Finnish pianist Paavali Jumppanen (a renowned Beethoven-specialist) played together with the Russian violinist Sergey Malov (who was a new acquaintance to us) were playing Antonin Dvorak’s Sonatina in G. Op.100. And it turned out to be an explosive show – two champions inspiring each other and getting the most and even more out of the masterpiece that they had chosen. But the ‘big bang’ was yet to come. In a late evening concert shortly afterwards Sergey Malov was playing Caprices of Paganini – and how! He managed to stun us be his ‘entrée’ by having the stage darkened and only the front part of it lit with dim red lights that were gradually brightened. And then he appeared as ‘the man from the darkness’ and played the caprices in an unforgettable way. To me (and to some friends of old who were also there) this brought into memory a scene in the Soviet-Moldavian film ‘Lautarii’ of the year 1972. In that scene a lautar (‘gypsy’) street-musician Toma Alistar has been smuggled to the house of a nobleman who is giving a concert on his premises and is clad like the professional musicians. The musicians start to play – in a routine-like way and the nobleman follows it with gestures of ‘dejà écoutée’. Then, the lights fall off and after a moment of chaos, Toma Alistar steps in from the darkness and plays the same music like a virtuoso. The lights reappear and the professional musicians join their new soloist. So much of the scene in the film. I managed to tell Sergey of this memory and then I found from Youtube the whole film as a Moldavian language version. At the same time Sergey had found it as a Russian language version – and seen the scene to which I referred. So, we had a common topic to discuss when we met every now and then. I got more interested of Sergey and he helped to find his CDs that were at sale and signed them for me. That was the start. Another highlight on the great stage was the joint performance of the German-Turkish violinist Önder Baloglu and the Finnish pianist Marko Hilpo, who played a very challenging piece of music in a later concert – Darius Milhaud’s Cinéma-fantasie , Op. 58b “Le boeuf sur le toit” – with great success. 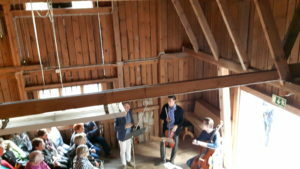 A British music teacher next to us said that this was the first time he heard that piece played by only two musicians – and successfully. He characterised that as a high risk effort – if not suicidial. Later on Önder told that that was exactly how they had felt it – and the joy of success was great. At a later phase, now in the church, there was a concert with Vivaldi’s Four Seasons. One of the fascinations of that performance was that there were four female violinists as soloists for one of the seasons. Minna Pensola started with Spring in her explosive way, then Elina Vähälä continued with Summer in a more calm tempo to be followed by the similarly calm Autumn soloist Alissa Margulis and then by the explosive Winter soloist Priya Mitchell (who was filmed by the above mentioned Dutch film crew). At the final phase we were deeply moved by the concert in which Daniel Rowland and his colleagues Hugo Ticciati, Gareth Lubbe and Julian Arp – the O/Modernt String Quartet – played Schubert’s “Der Tod und das Mädchen”. We had just received a very sad news and this quartet managed to do all in their powers to ease our sorrow. To be sure, there were many more great performances. But these were some of the striking moments that contributed to the very special Kuhmo experience. But it was not all about the concerts and on the performances of the artists on the stage. There is much more in the Kuhmo experience. I will try to illustrate some aspects in my next post. Yesterday morning I got from Finland the sad news that my former boss, professor Juhani Kirjonen – Jussi, as we used call him – had passed away. It so happened that his life span came to end just one month before Finland celebrates the 100th anniversary of its independence. To me, there is another striking coincidence with the news of Jussi. At the end of October I had just written out my memories of the period that I had worked together with Jussi at the University of Tampere in the years 1986-1987. At that time Jussi took the initiative to develop a post-graduate Master programme with focus on ‘Work Sciences’ (interdisciplinary consortium for research on working life). This was an interesting pilot initiative to engage researchers into cooperation with practitioners – HRD professionals, Health and Safety professionals, Training professionals. The aim was to get the participants shape developmental projects with conceptual and methodological support. Jussi, who had a long track record in interdisciplinary research on health and safety issues in working life, was convinced that the time was ripe for such a novelty – at that time there were hardly any postgraduate Master programmes in Finland (except the worldwide spread MBA programmes). Jussi had got funding for a planning project from the Ministry of Education and the rector of the University of Tampere had set up an interdisciplinary planning committee consisting of researchers from different faculties and of external experts from the competent bodies for Health and Safety. In the year 1986, just after graduating as an MA from educational and social sciences, I started as the curriculum planner for this initiative. That period – one and a half year – was quite an adventure for both of us. We didn’t take this just as a ‘local’ curriculum initiative but as an intellectual mobilisation to get a better institutional backing for research on working life. 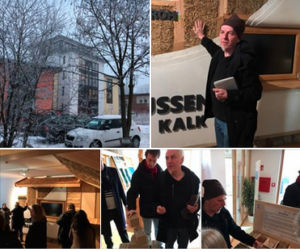 From this point of view I was exploring also international models and made a lot of use of the German innovation programme “Humanisation of Work” of the late 1970s and early 1980s. Also I provided information on the German debates on integrative approaches to ‘work sciences’ (Fürstenberg: Konzeption integrativer Arbeitswissenschaft) and on the efforts to bring conflicting views from ergonomy vs. work psychology together. This work with literature was important for my further career development. Alongside the planning work Jussi and I had several contacts with other interested researchers and with Social Partners. Also, after we had submitted the final report, we got involved in the discussion on launching a special research unit for research on working life. In that phase the initiative to set up a postgraduate Master programme got sidelined. Instead, the idea of a new interdisciplinary “Work Research Centre” got wide support and a this new centre was set up in record time bypassing all other earlier priorities of the university. However, in this final phase other researchers got the lead and Jussi retreated and took other duties. For me the new centre provided new opportunities to work in the research field “education and working life” and to create new international contacts – firstly in the joint initiatives of the Nordic countries (Denmark, Finland, Iceland, Norway, Sweden) and then with German research institutes – in particular with ITB. And this then brought me deeper to European cooperation in the field of vocational education end training (VET). And from 1994 on I worked several years in Cedefop (the European Centre for the Development of Vocational Training). Looking back, I could not have dreamed of making such career steps without the pioneering work with the curriculum planning initiative with Jussi. Also, during that period I enjoyed his strong support. Surely – there were also periods when we were not quite on the same page. But, what was more important, we got over those periods and we were happy to conclude our work with a good spirit. And, although the launch of the Work Research Centre was not a direct follow-up of our initiative, something of the good spirit was taken over during the ‘golden’ pioneering years. Therefore, I feel the loss of my former supervisor, but at the same time I am thankful for having experienced that interesting period of work with him.